Kind is a smart calendar that helps you power through the day with less screen time. It acts as a virtual assistant who communicates with people requesting for your time, helps you focus by eliminating distractions caused by notifications during busy tasks, all while looking after your digital well-being. This was presented as my capstone project at BrainStation and was given the opportunity to design a product based on a topic of our choice. Professionals these days are more stressed than ever and the demands of the daily workload is hard to avoid. But there are other factors that add to stress that are easier to manage. 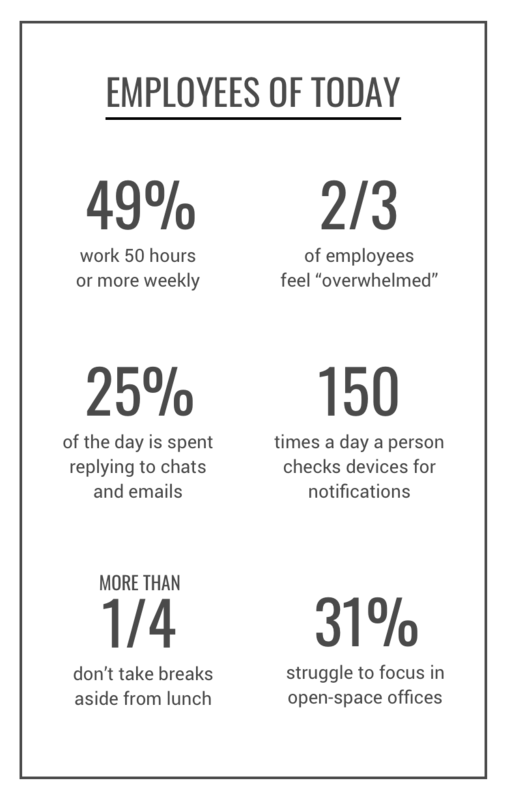 Study shows technology, not taking breaks, lack of courtesy (chatty co-workers), and open-space offices are also contributors to the cognitive load which last in our bodies for long periods of time. I wanted to design a solution that helps people form healthier habits and reduce cognitive fatigue at work. The challenge that was all four contributors felt too broad to tackle with one solution. I needed to ask how people address these issues in the real world and see how it could be merged into one product. People in technology was a suitable demographic to interview. They are always connected and their fast-paced jobs require a balance of collaboration and deep-thinking. The participants were comprised of 2 Developers, 2 Marketing Managers, a Sr. Business Development Manager and a Sr. Partnerships Manager. Half lived outside Toronto (Seattle, London and Australia) which required me to conduct a mix of 4 phone interviews and 2 Google Form surveys. The insights aligned with the problem space and recognized notification fatigue and working with chatty co-workers in open-space offices hindered their productivity. However, some were more affected than others. As per breaks, some only took them when stress levels were high or when they’ve worked for long periods of time. Adriana is a reflection of key insights extracted from the interviews and became a source of guidance every time a decision was made throughout this project. This breakdown of Adriana’s busy workday was intended to be detailed and overwhelming. As a designer, I wanted to feel her struggles and point out moments of interactions where I could potentially open up opportunities for resolution. A proto-persona for Adriana’s company, KonektRx was created to paint a better picture of her situation and give a deeper understanding of why she’s currently overwhelmed. From the data gathered, user stories were established to reflect the tasks Adriana would hope to accomplish in order to be more productive and less-stressed at work. Similar tasks were then clustered into the following epics which became the basis of the product’s key features. Set a time to focus on a task and avoid all possible distractions. Communicate with colleagues, respect their time and reach out ASAP when the matter is urgent. Be able to have a wide control of status and availability depending on workload. Improve well-being at work by taking breaks, practicing concentration, relaxation techniques, listening music, etc. As a designer, this phase required me to empathize with the user and logically think of her next steps and goals. I found this exciting as I soon realized that I was switching from problem-based to solution-based thinking. With the data I had, I was ready to design. My first attempt in designing a solution was a challenging experience. It was a peer-to-peer application that companies can use to let employees communicate their availability and request for each other’s time. When status is marked as ‘Busy’, users can block off incoming requests and notifications from chats and emails. I also somehow wanted to integrate music that boosted cognitive performance, as well as, break reminders. The core task was tested on paper and as wireframe prototypes. It received a lot of positive feedbacks during user testing, however, there were some insights that made me question it’s moral implications and adaptability. “What if some employees abuse “being busy”? “I assumed that this product was to be pitched to companies but what if companies don't buy-in due to regulations and fear of disrupting organizational process?" It didn’t feel right and the idea wasn’t cohesive. I realized I designed out of assumptions and intuition. It was time for a reset. On my second attempt, I was determined to design a product that even a single user can use, with features inspired by real world practices that people successfully use to reduce cognitive overload at work. So I did more research and asked more questions. This mix of original and new key findings still addressed the main epics listed above but created a completely new product which was about to be, Kind. Reduces the distractions of long-winded online conversations. Gives instant access to each other’s schedules which reduces back-and-forth communication. Sets expectations and mitigates pressure of replying right away. A focus technique that encourages sprints of being hyper-focused with 5-min break intervals to release cognitive load. 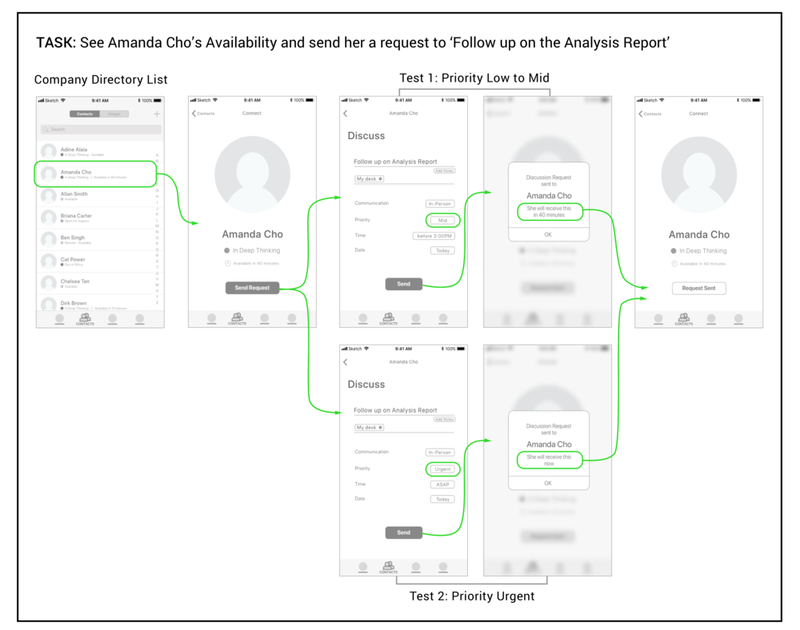 Another user flow was created to show how a person can request for her time using a WebApp that has a breakdown of her availability. By using Artificial Intelligence and integrating chat apps and email, the product can detect keywords related to meetings, bookings and discussions, which then sends an auto response with a link to the WebApp. Even though this was not designed, it helped me picture how two players communicated between a product and a WebApp. Understanding human interaction prior to design is very crucial. It set constraints and creates a system to follow which helps designers stay on track when making design decisions and product flow. Due to the massive pivot in the design, there was no time to test paper prototypes. After a quick ideation sketch, I went straight to wireframing as the main goal was to test and iterate as rapidly as possible. Sometimes, you have to work around the process in order to keep up with the timeline. Multiple rounds of testing were necessary to be able to improve the product experience and turn user confusion into user clarity. Below is a series of iterations showcasing the major testing feedbacks that impacted the final results. User testing feedbacks led me to merge redundant screens, create more control options for incoming requests, and take away elements that didn’t serve any practical purpose. Having a view of the 3 upcoming tasks on the ‘Home’ screen, which I designed to reduce overwhelm, didn’t seem necessary to the users. A monthly calendar view was also removed as users saw the product as more of a daily planner. However, this is something to be considered as planning ahead is always a good option to have. Feedbacks received during final testings and Demo Day were overall positive. People found Kind to be straightforward and intuitive. They were able to relate to the problem space and see the applicability of this product in their lives. How Else Can We Improve KIND? A big part of motivation is goal setting and performance tracking. It encourages and creates a deeper desire to build better habits. By integrating a dashboard, Adriana can track the number of notifications received throughout the day, the active time spent on her phone, and the number of ‘Focus Times’ she’s completed and dismissed. Emerging technologies such as Voice Assistance, creates a more holistic experience for the user. Managing the day hands-free with even less screen time will not only further increase Adriana's productivity but give her more free time to enjoy the finer things in life.